↑ ক খ গ ঘ ঙ চ Chandra, Satish. Medieval India: From Sultanat to the Mughals, Vol. 2, (Har-Anand, 2009), pp. 27-31. ↑ ক খ Watts, Tim J. 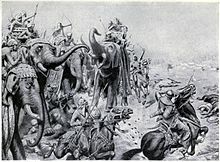 "Battles of Panipat". In Mikaberidze, Alexander (ed.) Conflict and Conquest in the Islamic World: A Historical Encyclopedia, (ABC-CLIO, 2011), p. 707.